Futuristic crime fighting requires intelligent video software to identify potential threats before they unfold. The developers of an augmented intelligent system are ready to demonstrate their cognitive video solution for commercial customers. As the law enforcement mandate for body cameras goes into effect, US law enforcement officers will capture over five million hours of body camera video each day. For an effective analysis, video needs to be combined with other video or existing data, but due to the massive computing power required to sift through petabytes of video, that is nearly impossible. There are many initiatives working on cyber security solutions, facial and other recognition systems, motion detection, etc…but the problem of making sense from massive amounts of video information, coupled with other information sources, is not simple. It will require a breakthrough technology. 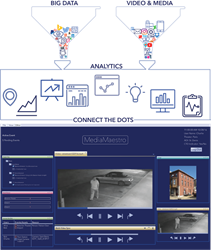 MediaMaestro is a predictive cognitive security solution that leverages continuous monitoring of massive data sets generated from camera networks to identify trouble before events unfold. A breakthrough indeed. The system’s motion and activity detection feature with behavioral-pattern analysis, identifies movement anomalies consistent with potential threat activity. The patent-pending technology uncovers suspicious behaviors using a cognitive technique to draw connections between data extracted from video and behavior patterns. Once a behavior pattern has been identified the software searches for supporting information across open source or private data streams for evidence to either corroborate or change its conclusion. The end result is a single screen solution that enhances a security professional’s crime fighting decisions. MediaMaestro’s amazing technology represents a twenty-five year research effort lead by the US government. Recently, GTOP’s cognitive tools were examined by The Cognitive Systems Alliance. CSA is a new accreditation organization led by a council of cognitive systems scientists and commercial business leaders. The approach to behavior modeling, encoding workflow, cognitive processes, and talent received a Gold Level III Certified rating, the highest mark. Security professionals need a future response to threats during dangerous times and they must have tools to quickly authenticate and validate data from disparate streams. MediaMaestro’s video monitoring and investigative capability provides a new way to automate and speed up complex tasks during the investigative process. Augmenting a security analyst’s view of the world with artificial intelligence will stop hardened-criminals and terrorists before they strike.